In recent years, thiazolidinone and their derivatives have become among the most extensively investigated compounds [1-5]. They constituted a very important group of heterocyclic compounds, having valuable biological activities in the areas of medicine as well as agriculture. The thiazolidinone scaffold is a central part of biologically active compounds with various applications and uses [6-8] such as antibacterial [9-11], antifungal [12-14], anticancer [15,16], anti-tubercular [17,18], antimalarial , anticonvulsant [20,21], anti-inflammatory [22,23], anti-HIV [24,25] and analgesic . The 4-thiazolidinone moiety is very versatile and has featured in many drugs (Figure 1) and several compounds with 4-thiazolidinone core structure were found to kill selectively drug resistant cancer cells and induce cell death . The peptidoglycan is an essential component of the cell wall of both Gram-positive and Gramnegative bacteria. The 4-Thiazolidinones have been reported as novel inhibitors of the bacterial enzyme Mur B which is precursor acting during the biosynthesis of peptidoglycan . The Vilsmeier-Haack reagent has been proud to be a versatile reagent capable of exacting a large variety of synthesis transformation . It finds application in formylation , cyclonaloaddition  and cyclisation . Recently, its potentiality wax explored in the synthesis of substituted aldehydes from acetanilide, N,N-dimethylformamide (DMF) and phosphoryl trichloride (POCl3) to develop novel quinolone based, fused, heterocyclic systems as potential anticancer agents [33-39], a quinolone nucleus with different substituent’s at 2 and 3 positions was required which afforded a versatile synthon for farther hetero annulations. For the past few years, our group has also been preparing and evaluating biologically important compounds. The most common approach for the synthesis of the thiazolidinone ring involves substituted aldehyde, substituted amine and thioglycolic acid in one step or two steps. So many researchers have dedicated much effort to synthesis of 4-thiazolidinones using benzene or toluene [40,41], PEG , ionic liquids [43,44], Bi(SCH2COOH)3 , ZnCl2 , protic acid , zeolite , silica gel , and Saccharomyces cerevisiae  as catalysts. However, some of these procedures have major disadvantages, for example prolonged reaction time, use of special apparatus (Dean and Stark assembly), use of much expensive and environmentally very toxic catalysts and solvents, and low or moderate yields. Therefore, because of recent interest in green chemistry, there is a need to develop a simple and highly efficient procedure using a reusable and environment-friendly catalyst and Multicomponent reaction [51-55]. In continuation of our work [56-63], on the synthesis of bioactive compounds, we have synthesized some thiazolidinone analogues. Here, we wish to mention the development and implementation of a methodologies allowing for the synthesis of 2-chloro-(substituted) quinoline-3-carbaldehyde (2a-d) and 2-((substituted)-2-chloroquinolin-3-yl)-3-((substituted) phenyl) thiazolidin-4-one (5a-p). Substituted acetanilide, β-cyclodextrin-SO3H, aromatic amines, DMF, POCl3 and various solvents were commercially available. The major chemicals were purchased from Sigma Aldrich and Avra labs. Reaction courses were monitored by TLC on silica gel precoated F254 Merck plates. Developed plates were examined with UV lamps (254 nm). The IR spectra were recorded on FT-IR (Bruker). The melting points were recorded on SRS Optimelt, melting point apparatus and these are uncorrected. The 1H NMR spectra were recorded on a 400 MHz Bruker spectrometer. The chemical shifts are reported as δppmunits. The 13C NMR spectra were recorded on a 100 MHz Bruker spectrometer. Chemical shifts are reported as δppm units. The following abbreviations are used; singlet (s), doublet (d), triplet (t), quartet (q), multiplet (m) and broad (br). The mass spectra were taken with micromass- QUATTRO-II of water mass spectrometer. We have developed the protocol for synthesis and screening of model reaction of 2-chloroquinoline-3-carbaldehyde (2a) (Scheme 1) by cyclisation between acetanilide towards DMF and POCl3. In terms of the effect on the yield compounds 2a-d upon varying the molar proportions of POCl3 from 3 moles to 18 moles (Table 1). The Vilsmeier-Haack reaction of acetanilide 1a (1 mmol), DMF (3 mmol) and POCl3 (12 mmol) without solvent and various proportions was selected as a model reaction to optimize the reaction conditions. In terms of the effect various molar proportions on the cyclisation reaction, acetanilide 1a (1 mmol), DMF (3 mmol) and POCl3 (12 mmol) molar proportions was found to be the best molar proportions for the reaction (Table 1); other molar proportions, were less efficient (Table 1). Scheme 1: Screening of model reaction of 2-chloroquinoline-3-carbaldehyde (2a)a. aReaction condition (2a): N-phenylacetamide (1a), DMF, POCl3, 0-5ÃÂ°C, 1 h, reflux 2-9 h.
aAll the reaction was carried out in various molar proportion of compounds, bIsolated yield. Table 1. Screening of the molar proportions, reaction time and yield (2a)a. The DMF and POCl3 molar proportions 3:3 and 3:6 gave the corresponding product in a 27% and 25% yield, which was the worst among these molar proportions (Table 1). Nevertheless, these yields were generally low before further optimizations. To increase the efficiency of the reaction, the effects of different molar proportions were investigated (Table 1). The entry 4 exhibited the best performance with molar proportions of DMF and POCl3 3:12 (96%). The molar proportions 3:15 and 3:18 gives good yields (Table 1). All the reactions were carried out in various molar proportions of each compound. Among these reactions, 3:12 molar proportions turned out to be the best choice with yields of 98%. We would like to mention here this molar proportion was the best choice with a better yield and less time required for the completion of the reaction (Table 1). Thus, we decided to carry out the reactions in 3:12 molar proportions. As shown in Table 1, optimal conventional method reaction conditions were obtained using molar proportional ratio of 1:3:12 of acetanilide: DMF: POCl3 respectively in the absence of the solvent. This optimal reaction conditions, the synthesis of the compound (2a–d) by Vilsmeier-Haack reaction showed in Scheme 2 and Table 2. Figure 2: Synthesis of 2-chloro-(substituted) quinoline-3-carbaldehyde (2a-d)a. aReaction conditions: 2a-d (1 mmol), DMF (3 mmol), POCl3 (12 mmol), Temp. 80-90ÃÂ°C, 2-3 h.
Table 2. Physical data of 2-chloro-(substituted) quinoline-3-carbaldehyde (2a-d)a. Further, we synthesized title compounds of 2-((substituted)-2-chloroquinolin-3-yl)-3-((substituted) phenyl) thiazolidin-4-one (5a-p). But before that we were screening catalyst, solvents, reaction time and yield of model reaction 2-(2-chloroquinolin-3-yl)-3- phenylthiazolidin-4-one (5a) (Schemes 3 and 4; Tables 3 and 4). Figure 3: Screening of model reaction 2-(2-chloroquinolin-3-yl)-3-phenylthiazolidin-4-one (5a)a aReaction condition (5a): 2a (1 mmol), 3a (1 mmol), thioglycolic acid 4 (1.5 mmol), water (5 ml), catalyst (10 mol%), Reflux 1-12 h.
Figure 4: Screening of model reaction 2-(2-chloroquinolin-3-yl)-3-phenylthiazolidin-4-one (5a)a aReaction condition (5a): 2a (1 mmol), 3a (1 mmol), thioglycolic acid 4 (1.5 mmol), Solvent, Reflux 1-12 h.
aReaction conditions: 2a (1 mmol), 3a (1 mmol), thioglycolic acid 4 (1.5 mmol), water (5 ml), catalyst (10 mol %), bIsolated yield. Table 3. Screening of catalyst for the model reaction (5a)a.
aReaction conditions: 2a (1 mmol), 3a (1 mmol), thioglycolic acid 4 (1.5 mmol), ÃÂ-cyclodextrin-SO3H (10 mol %), aIsolated yield. Table 4. Screening of solvents for the model reaction (5a)a. In view of green chemistry, it was decided to prefer water as solvent in our initial study for optimization of the catalyst. During this study, the model reaction was performed using water as a reaction medium at reflux temperatures. The desired product 5a was obtained in 20% only, even after reaction for 9h in water under reflux (Table 4). In a subsequent experimental detailed, various acid catalysts bearing sulfonated functionality, for example sulfamic acid, sulfanilic acid, p-toluenesulfonic acid (p-TSA), and β-cyclodextrin-SO3H and other catalyst such as Hydrochloric acid, Piperidine ammonium acetate, Pyrrolidine ammonium acetate were screened under reflux conditions with water as a solvent. Reactions conducted in the presence of Hydrochloric acid, Piperidine ammonium acetate, Pyrrolidine ammonium acetate, sulfamic acid, p-TSA and sulfanilic acid given less yield even after completion of reaction with 50%, 30%, 38%, 20%, 30%, and 45% yields respectively. (Table 3). When β-cyclodextrin-SO3H was used, the reaction afforded 5a in 80% yield within 1 h (Table 3). The investigation toward the effect of solvent, the model reaction was further performed with β-cyclodextrin-SO3H in different solvents (acetic acid, DMF, methanol, toluene, ethanol, and Isopropanol) (Table 4). Use of these solvents failed to improve the yield and rate of the reaction. However, considering the increasing importance of solvent-free reactions in organic synthesis, we examined the catalytic efficiency of β-cyclodextrin-SO3H in the absence of the solvent. The rate of the reaction increased substantially and the desired product 5a was obtained in higher yield 98% (Table 4). Thus, β-cyclodextrin-SO3H proved the most efficient acidic catalyst in terms of time and yield. We like to mention here in solvent-free were the best choice and less time required for reaction completion. We decided to carry out the further reaction in solvent-free condition with β-cyclodextrin-SO3H catalyst (Scheme 5; Table 5). However, the reaction provides cleaner reaction, short reaction time, and the products were only required to be washed with ice-cold water. The yields are good to excellent. To assess the generality of this reaction, substrate scope was investigated under the optimized conditions; the results are listed in Table 5. The various aldehyde and anilines were cyclocondensed with thioglycolic acid to afford a variety of 4-thiazolidinones (Table 5). Aromatic aldehydes with electron withdrawing or donating substituents reacted very well, affording good to excellent yields of 4-thiazolidinones. Figure 5: Synthesis of 2-((substituted)-2-chloroquinolin-3-yl)-3-((substituted) phenyl) thiazolidin-4-one (5a-p)a.
aReaction condition (5a-p): 2a-d (1 mmol), 3a-d (1 mmol), thioglycolic acid 4 (1.5 mmol), ÃÂ-cyclodextrin-SO3H (10 mol %), reflux for 2-5 h, bIsolated yields. Table 5. Physical data of 2-((substituted)-2-chloroquinolin-3-yl)-3-((substituted) phenyl)thiazolidin-4-one(5a-p)a. For reasons of economy, the stability and sustained activity of the catalysts are extremely important. Thus, recovery and reuse of β-cyclodextrin-SO3H in the model reaction were also studied. After completion of the reaction, the mixture was cooled to room temperature and ethyl acetate was added. The solid catalyst was isolated by filtration of the reaction mixture, washed with ethyl acetate, dried in an oven then reused for further catalytic cycles. A plausible mechanism for the reaction is proposed as shown in Scheme 6. The catalyst β-cyclodextrin-SO3H activates to the aldehyde by increasing the electrophilicity of its carbonyl group to facilitate the formation of the imine intermediate (I). The anion of β-cyclodextrin-SO3H might enhance the nucleophilicity of the mercapto group of thioglycolic acid, causing its facile addition to the imine intermediate generated in situ. The β-cyclodextrin-SO3H then activates the carbonyl group of acid of intermediate (II), leading to intramolecular cyclization then dehydration to afford the thiazolidinone (III). Figure 6: Plausible reaction mechanism for the synthesis of thiazolidin-4-one. We have successfully developed a β-cyclodextrin-SO3H catalyzed an easy access to a new series of a facile one pot three component synthesis of 2-((substituted)-2-chloroquinolin-3-yl)-3-((substituted) phenyl) thiazolidin-4-one. This catalyst is highly active, mild reaction conditions, good to excellent yields, easy work-up, reused without significant loss of activity and easily available substrate make this reaction an attractive method for the preparation of compounds 5a-p. This procedure has many advantages over other methods, for example shorter reaction times, recycling and reuse of a heterogeneous biopolymer-based solid-acid catalyst, convenient one-pot operation, and simple experimental procedure. The authors thankful to Head, Department of Chemical Technology, Dr. Babasaheb Ambedkar Marathwada University, Aurangabad 431004 (MS), India for providing the laboratory facility. The authors are also thankful to the principal, Head, Department of Chemistry, Deogiri college, Station road, Aurangabad 431 005, MS, India, for providing the laboratory facility. Desai KG, Desai KR. A facile microwave enhanced synthesis of sulfur-containing 5-membered heterocycles derived from 2-mercaptobenzothiazole over ZnCl2/DMF and antimicrobial activity evaluation. J Sulfur Chem. 2006;27:315-328. Barreca ML, et al. Design, synthesis, structure-activity relationships, and molecular modeling studies of 2, 3-diaryl-1, 3-thiazolidin-4-ones as potent anti-HIV agents. J Med Chem. 2002;45:5410-5413. Rawal RK, et al. Synthesis and evaluation of 2-(2,6-dihalophenyl)-3-pyrimidinyl-1, 3-thiazolidin-4-one analogues as anti-HIV-1 agents. Bioorg Med Chem. 2007;15:3134-3142. Srivastava VK, et al. Synthesis of newer thiadiazolyl and thiazolidinonyl quinazolin-4(3H)-ones as potential anticonvulsant agents. Eur J Med Chem. 2002;37:873-882. Dwivedi C, et al. Substituted thiazolidones as anticonvulsants. J Med Chem. 1972;15:553-554. Hongyu Z, et al. Design, synthesis, cytoselective toxicity, structure-activity relationships, and pharmacophore of thiazolidinone derivatives targeting drug-resistant lung cancer cells. J Med Chem. 2008;51:1242-1251. Diurno MV, et al. Synthesis and antihistaminic activity of some thiazolidin-4-ones. J Med Chem. 1992;35:2910-2912. Solomon VR, et al. Synthesis and antimalarial activity of side chain modified 4-aminoquinoline derivatives. J Med Chem. 2007;50:394-398. Rida SM, et al. Syntheses and in vitro antimicrobial evaluation of some benzimidazol-2-ylmethylthioureas, benzimidazol-2-ylacetylthiosemicarbazides and products of their condensation with monochloroacetic acid. Pharmazie. 1986;41:475-478. Bhat AR, Singh D. J Indian Pharm Sci. 1988;50:169-171. Bonde CG, Gaikwad NJ. Synthesis and preliminary evaluation of some pyrazine containing thiazolines and thiazolidinones as antimicrobial agents. Bioorg Med Chem. 2004;12:2151-2161. Giri S, et al. Synthesis of some 3-(5'-aryloxymethyl-1',3',4'-thiadiazol-2'-yl)-2-aryl-4-thiazoldinones and their antifungal activity. J Indian Pharm Sci. 1990;52:108-110. Capan G, et al. New 6-phenylimidazo[2,1-b]thiazole derivatives: synthesis and antifungal activity. Monatshefte fur. Chemie. 1999;130:1399-1407. Karali N, et al. New cyclohexylidenehydrazide and 4-aza-1-thiaspiro[4.5]decan-3-one derivatives of 3-phenyl-4(3H)-quinazolinones. Farmaco. 1998;53:346-349. Menicagli R, et al. In Vitro Cytotoxic Activities of 2-Alkyl-4,6-diheteroalkyl-1,3,5-triazines: New Molecules in Anticancer Research. J Med Chem. 2004;47:4649-4652. Sala M, et. al. Synthesis and cytotoxic activity evaluation of 2,3-thiazolidin-4-one derivatives on human breast cancer cell lines. Bioorg Med Chem Lett. 2013;23:4990-4995. Ulusoy N. Synthesis and antituberculosis activity of cycloalkylidenehydrazide and 4-aza-1-thiaspiro[4.5]decan-3-one derivatives of imidazo[2,1-b]thiazole. Arzneim Forsch Drug Res. 2002;52:565-571. Babaoglu K, et al. Novel inhibitors of an emerging target in Mycobacterium tuberculosis; substituted thiazolidinones as inhibitors of dTDP-rhamnose synthesis. Bioorg Med Chem Lett. 2003;13:3227-3230. Sergio M, et al. A Combinatorial Approach to 2,4,6-Trisubstituted Triazines with Potent Antimalarial Activity: Combining Conventional Synthesis and Microwave-Assistance. Chem Med Chem. 2008;3:873-876. Shiradkar MR, et al. Synthesis and anticonvulsant activity of clubbed thiazolidinone-barbituric acid and thiazolidinone-triazole derivatives. ARKIVOC 2007;14:58-74. Agarwal A, et al. Synthesis and anticonvulsant activity of some potential thiazolidinonyl 2-oxo/thiobarbituric acids. Eur J Med Chem. 2006;41:1223-1229. Unangst PC, et al. Synthesis and biological evaluation of 5-[[3,5-bis(1,1-dimethylethyl)-4-hydroxyphenyl]methylene]oxazoles, -thiazoles, and -imidazoles: novel dual 5-lipoxygenase and cyclooxygenase inhibitors with antiinflammatory activity. J Med Chem. 1994;37:322-328. Ottana R, et al. 5-Arylidene-2-imino-4-thiazolidinones: Design and synthesis of novel anti-inflammatory agents. Bioorg Med Chem. 2005;13:4243-4252. Chen H, et al. Ungeremine effectively targets mammalian as well as bacterial type I and type II topoisomerases. Bioorg Med Chem Lett. 2012;22:7041-7044. Balzarini J, et al. Synthesis and anti-HIV studies of 2-adamantyl-substituted thiazolidin-4-ones. Eur J Med Chem. 2007;42:993-1003. Viana GS, et al. Analgesic and anti-inflammatory effects of chalcones isolated from Myracrodruon urundeuva allemão. Phytomedicine. 2003;10:189-195. Havrylyuk D, et al. Synthesis and anticancer activity evaluation of 4-thiazolidinones containing benzothiazole moiety. Eur J Med Chem. 2010;45:5012-5021. Andres CJ, et al. 4-Thiazolidinones: novel inhibitors of the bacterial enzyme murB. Bioorg Med Chem Lett. 2000;10:715-717. Bartmann W, et al. Synthesis and Reactions of Isoquinoline Derivatives II.1 Synthesis of 3-Chloroisoquinoline-4-aldehydes. Synthesis. 1988;9:680-683. Newman MS, Sujeeth PK. Conversion of aromatic and .alpha.,.beta.-unsaturated aldehydes to dichlorides by thionyl chloride and dimethylformamide. J Org Chem. 1978;43:4367-4369. Boeckman RZK, Jr., Ganem B. Differentiation of diols; A new synthesis of bromoformates and protected hydroxyaldehydes. Tetrahedron Lett. 1974;15:913-916. Rao MSC, Rao GSK. Indian J Chem. 1988;27B:213-216. Mogilaiah K, et al. Microwave assisted synthesis of 2-chloro-quinoline-3-carboxaldehydes. Indian J Hetero Chem. 2002;11:253-254. Pulin N, Sreedhar DD. Synthesis, Characterization and Antimicrobial studies of Co(II), Ni(II), Cu(II) and Zn(II) complexes derived from a Schiff base of 2-[(4-Methyl-2-oxo-2Hchromen- 7-yl)oxy]acetohydrazide with 3-formyl-2-hydroxy quinoline and 3- formyl-2-mercapto quinoline. J Chem Pharma Res. 2012;4:851-865. Carlos FG, et al. Synthesis of New 3-(2-Chloroquinolin-3-yl)-5-Phenylisoxazole Derivatives via Click-Chemistry Approach. J Braz Chem Soc. 2014;25:365-371. Saravanan N, et al. Efficient Synthesis of Quinolo- Oxepanes Through [3+ 2] Cycloaddition Reaction of αβ - Unsaturated Ester with Unstabilized Azomethine Ylides. Asian J Chem. 2015;27:3667-3670. Kalita PK, et al. Synthesis of novel pyrano[2,3- b]quinolines from simple acetanilides via intramolecular 1,3-dipolar cycloaddition. Tetrahedron Lett. 2006;47:7779-7782. Suman P, et al. Synthesis and evaluation of functionalized aminobenzoboroxoles as potential anti-cancer agents. J Organometallic Chem. 2015;798:125-131. Mistry BM, Jauhari S. Quinoline-based azetidinone and thiazolidinone analogues as antimicrobial and antituberculosis agents. Med Chem Res. 2013;22:647-658. Belardi PG, et al. Synthesis of 2-(5′-substituted isoxazol-3′-yl)-4-oxo-3-thiazolidinylalkanoic acids. J Heterocyl Chem.1982;19:557-560. Holmes CP, et al. Strategies for Combinatorial Organic Synthesis: Solution and Polymer-Supported Synthesis of 4-Thiazolidinones and 4-Metathiazanones Derived from Amino Acids. J Org Chem. 1995;60:7328-7333. Bhosle MR, et al. Polyethylene glycol mediated one-pot three-component synthesis of new 4-thiazolidinones. Heteroatom Chem. 2012;23:166-170. Yadav AK, et al. An ionic liquid mediated one-pot synthesis of substituted thiazolidinones and benzimidazoles. Tetrahedron Lett. 2009;50:5031-5034. Zhang X, et al. Fan, Ionic liquid mediated and promoted eco-friendly preparation of thiazolidinone and pyrimidine nucleoside-thiazolidinone hybrids and their antiparasitic activities. Bioorg Med Chem Lett. 2009;19:6280-6283. Foroughifar N, Ebrahimi S. One-pot synthesis of 1,3-thiazolidin-4-one using Bi(SCH2COOH)3 as catalyst. Chin Chem Lett. 2013;24:389-391. Srivastava SK, Srivastava SL. Synthesis of 5-arylidene-2-aryl-3-(2-chlorophenothiazinoacetamidyl)-1,3- thiazolidin-4-ones as antifungal and anticonvulsant agents. J Ind Chem Soc. 2002;77:104-105. Kumar D, et al. Synthesis of 5-arylidene-2-aryl-3-(2-chlorophenothiazinoacetamidyl)-1,3- thiazolidin-4-ones as antifungal and anticonvulsant agents. Green Chem. 2013;15:2872-2884. Tiwari V, et al. Microwave assisted synthesis of quinolinyl thiazolidinones using Zeolite as an efficient and recyclable activation surface: SAR and Biological activity. Der Pharma Chemica. 2010;2:187-195. Thakare MP, et al. Silica gel promoted environment-friendly synthesis of 2,3-disubstituted 4-thiazolidinones. Tetrahedron Lett. 2014;55:2463. Pratap UR, et al. Saccharomyces cerevisiae catalyzed one-pot three component synthesis of 2, 3-diaryl-4-thiazolidinones. Tetrahedron Lett. 2011;52:1689-1691. Lamani DS, et al. An efficient carbodiimide-mediated synthesis and DNA-binding studies of novel 2-chloro/mercapto-quinoline-fused 1,3-thiazolidinones via one-pot three-component condensation. J Sulfur Chem. 2010;31:49-59. Singh, et al. Biochem. Cellular Archives. 2014;14:151-155. Mistry MS, Jauhari S. Quinoline-based azetidinone and thiazolidinone analogues as antimicrobial and antituberculosis agents. Med Chem Res. 2013;22:647-658. Tiwari V, et al. Microwave assisted synthesis of quinolinyl thiazolidinones using Zeolite as an efficient and recyclable activation surface: SAR and Biological activity. Pharma Chemica. 2010;2:187-195. Datta NJ, et al. 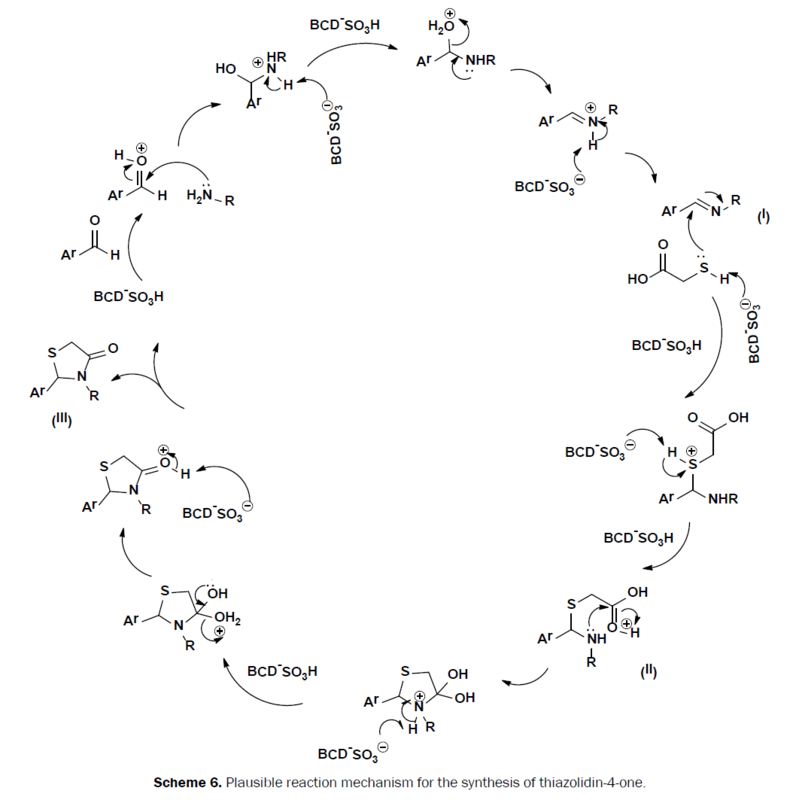 Synthesis of some new 4-Thiazolidinones as biologically potent agents. Indian J Chem. 2002;41B:433-435. Pansare DN, et al. One pot three components microwave assisted and conventional synthesis of new 3-(4-chloro-2-hydroxyphenyl)-2-(substituted) thiazolidin-4-one as antimicrobial agents. Bioorg Med Chem Lett. 2014;24:3569-3573. Darandale SN, et al. Green synthesis of tetrahydropyrimidine analogues and evaluation of their antimicrobial activity. Bioorg Med Chem Lett. 2013;23:2632-2635. Darandale SN, et al. A novel amalgamation of 1,2,3-triazoles, piperidines and thieno pyridine rings and evaluation of their antifungal activity. Eur J Med Chem. 2013;65:527-532. Pansare DN, Shinde DB. A facile synthesis of (Z)-5-(substituted)-2-(methylthio)thiazol-4(5H)-one using microwave irradiation and conventional method. Tetrahedron Lett. 2014;55:1107-1110. Pansare DN, Shinde DB. A Facile Synthesis of (Z)-2-((5-(4-fluorobenzylidene)-4-oxo-4,5- dihydrothiazol-2-yl) amino)Substituted Acid Using Microwave Irradiation and Conventional Method. Open Chem J. 2015;2:40-46. Pawar CD, et al. Synthesis and antimicrobial evaluation of novel ethyl 2-(2-(4-substituted)acetamido)-4-subtituted-thiazole-5-carboxylate derivatives. Bioorg Med Chem Lett. 2016;26:3525-3528. Pansare DN, Shinde DB. Synthesis and Antimicrobial Activity of new (Z)-2-((5-(4-Hydroxybenzylidene)-4-Oxo-4,5-Dihydrothiazol-2-Yl)Amino) Acid and its Derivatives. Res Rev J Chem. 2015;4:8-14. Shelke RN, et al. Synthesis of Novel 2H-Pyrano[2,3-D]Thiazole-6-Carbonitrile Derivatives in Aqueous Medium. Res Rev J Chem. 2016;5:29-36.